The Tiger Moth trainer prototype was derived from the DH 60 de Havilland Gipsy Moth in response to Air Ministry specification 13/31 for an ab-initio training aircraft. The main change to the DH Moth series was necessitated by a desire to improve access to the front cockpit since the training requirement specified that the front seat occupant had to be able to escape easily, especially when wearing a parachute. Access to the front cockpit of the Moth predecessors was restricted by the proximity of the aircraft's fuel tank directly above the front cockpit and the rear cabane struts for the upper wing. The solution adopted was to shift the upper wing forward but sweep the wings back to maintain the centre of lift. Other changes included a strengthened structure, fold-down doors on both sides of the cockpit and a revised exhaust system. It was powered by a de Havilland Gipsy III 120hp engine and first flew on 26 October 1931 with de Havilland Chief Test Pilot Hubert Broad at the controls. One distinctive characteristic of the Tiger Moth design is its differential aileron control setup. The ailerons (on the lower wing only) on a Tiger Moth are operated by an externally mounted circular bellcrank, which lies flush with the lower wing's fabric undersurface covering. This circular bellcrank is rotated by metal cables and chains from the cockpit's control columns, and has the externally mounted aileron pushrod attached at a point 45� outboard and forward of the bellcrank's centre, when the ailerons are both at their neutral position. This results in an aileron control system operating, with barely any travel down at all on the wing on the outside of the turn, while the aileron on the inside travels a large amount upwards to counter-act adverse yaw. 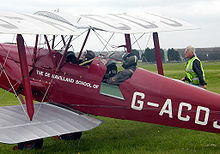 The RAF ordered 35 dual-control Tiger Moth Is which had the company designation DH 82. A subsequent order was placed for 50 aircraft powered by the de Havilland Gipsy Major I engine (130hp) which was the DH 82A or to the RAF Tiger Moth II. 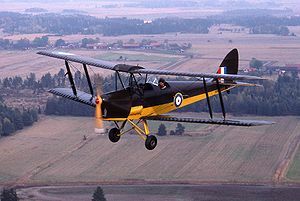 The Tiger Moth entered service at the RAF Central Flying School in February 1932. By the start of the Second World War, the RAF had 500 of the aircraft in service and large numbers of civilian Tiger Moths were impressed to meet the demand for trainers. The Tiger Moth became the foremost primary trainer throughout the Commonwealth and elsewhere. It was the principal type used in the British Commonwealth Air Training Plan where thousands of military pilots got their first taste of flight in this robust little machine. The RAF found the Tiger Moth's handling ideal for training future fighter pilots. Whilst generally docile and forgiving in the normal flight phases encountered during initial training, when used for aerobatic and formation training the Tiger Moth required definite skill and concentration to perform well - a botched manoeuvre could easily cause the aircraft to stall or spin. Picture - DH-82B Queen Bee, 2008. Built 1944. 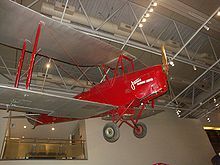 In Canada, de Havilland manufactured 1,523 of the DH 82C, which had a 145hp D.H. Gipsy Major 1C engine and other modifications including a tail wheel replacing the original tail skid, a stronger undercarriage with wheels set farther forward and enclosed cockpit with a sliding canopy necessitated by the cold northern climate. The de Havilland Canada operation also supplied 200 Tiger Moths to the USAAF, which designated them the PT-24. 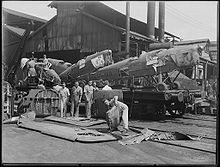 A further 151 were built in Norway, Sweden and Portugal while 2,949 Tiger Moths were built by other countries of the British Commonwealth. DH.60T Moth Trainer/Tiger Moth Military training version of the De Havilland DH.60 Moth. First eight prototype DH.82 configuration aircraft were named Tiger Moth. DH.82 Tiger Moth (Tiger Moth I) Two-seat primary trainer aircraft. Powered by a 120 hp (89 kW) de Havilland Gipsy III piston engine; renamed Tiger Moth I in RAF. DH.82A Tiger Moth (Tiger Moth II) Two-seat primary trainer aircraft. Powered by a 130 hp (97 kW) de Havilland Gipsy Major piston engine. 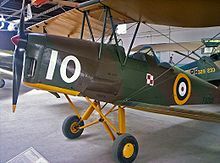 Named Tiger Moth II in RAF. DH.82B Queen Bee Unmanned radio-controlled target drone; 380 built. As of 2008, the sole remaining airworthy Queen Bee resides at RAF Henlow, England. DH.82C Tiger Moth Cold weather operations version for the RCAF. Fitted with sliding glass canopies and cockpit heating. Powered by a 145 hp (108 kW) de Havilland Gipsy Major piston engine; 1,523 built. PT-24 Moth United States military designation for the DH.82C ordered for Lend-Lease to the Royal Canadian Air Force; 200 built by de Havilland Canada. Picture - de Havilland Tiger Moth (A17-711) in Second World War training colours at the RAAF Museum. Thunderbird 6, a film which features the Tiger Moth prominently. Bransom, Alan. The Tiger Moth Story, Fifth Edition. Manchester, UK: Cr�cy Publishing Ltd., 2005. ISBN 0-85979-103-3. Ketley, Barry and Mark Rolfe. Luftwaffe Fledglings 1935-1945: Luftwaffe Training Units and their Aircraft. Aldershot, GB: Hikoki Publications, 1996. ISBN 0-9519899-2-8.